In the office (where I used to work), we often have gift exchange. Instead of getting items like Christmas dolls, mugs or chocolates, I tend to buy items like table calendars or diaries since right after Christmas it is the New Year. These are useful items for my colleagues who have the calendars (that I bought) all round the year on their desk. I could see my gift is well appreciated and being made good use. However specially for a long time friend who is also my former boss, I would get her a feng shui calendar which is more expensive compared to other table calendar. When I started working, it was so easy to get table and wall calendars for free from companies. However, as the years goes by, I find these are hard to come along. I always think that table calendars are a relatively low cost marketing tool- where people would display on counters and their work desk the whole year round. Due to cost cutting, many companies stop producing table calendars but in my opinion, they are giving up to put their names out there. For the normal table calendars, you can find from Popular bookstore, gift shops, Daiso and Kaison. 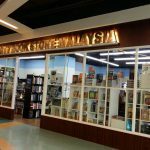 However for feng shui calendars, they are mostly available in Popular bookstore (the larger ones) and MPH. 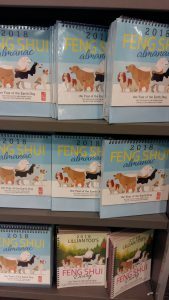 Above: Joey Yap’s table calendar and other feng shui yearly reference. Above: Lilian Too’s feng shui calendar and diary. It is visually appealing with nice creatives. Both the calendars cost above RM20 each. 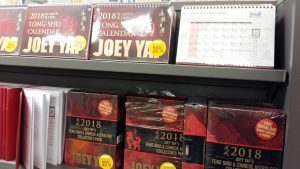 Usually, I would buy Joey Yap’s calendar for my friend- it is no doubt less decorative but it contained a lot of information. In the past my bosses used to insist on having Lion Dance for the office and I had been organizing it. We would usually refer to the feng shui calendar to see which date is not a ‘bad day’ to have the Lion Dance (because as part of Chinese custom, it is believed if you have it on a bad date, it would make things much worst). 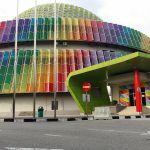 I remember one year, another department chose to have the Lion Dance on a less favourable day as indicated in the Joey Yap calendar. I did tell the organizer that it seemed that the day was not a good day but they went ahead. That year, the department did face a lot of challenges.